Early last Saturday morning, the first morning when Fall felt as though it had really arrived, I showed up at Wing and a Prayer Farm for sheep shearing school with Tammy White and the gentleman in the photograph: shearing legend Fred DePaul. Perhaps because I am still in the mindset of a classroom teacher (it will be a while before I can call myself a shepherd, the new profession I have chosen), I saw so many parallels between the way I learned what I learned that day, and what I know to be great teaching in practice. First, there was Fred himself. It is no small feat to wrestle a sheep into shearing position, methodically go about the process of taking its coat of wool off in such as way as to render the wool most useful for spinning, and explain the process to a group of people who have never done this before so that they would be willing (excited even!) to get in line and have a go right away. Oh, I forgot to add to the above list the act of storytelling, which Fred is a master at. That is great teaching. Once he had shown us the way, he guided each of us through the process, encouraging and advising, prompting and cajoling. It couldn’t have been easy to watch us stumble over the steps, and struggle to maintain control of the sheep (docile as they are, they are also stubborn and wily). But, never once did Fred waver in his patience, in his faith that we could accomplish the task. We made many mistakes, but Fred never made us feel that any of those mistakes made us failures. That, too, is great teaching. Then there was Tammy herself, fiber farmer extraordinaire, who had opened her farm and cleared her very busy day so that farmers-in-the-making could have first hand experience in a low-stakes way. Tammy is in the foreground, in red flannel. She conferred with each of us, got to know our interests and concerns, managed shearing school even as she managed the work of the farm (with over 100 animals in her sole care, she is a woman with a LOT going on), and opened every aspect of what she does (did I mention that she does a LOT?) to her visitors for inspection and query. She was honest about the hard work involved, but also about the joy inherent in that work – and that joy was so evident and genuine, that it could not but inspire each of us to want to take on the mantle of that work as well. That’s great teaching. There are a wide variety of living things on Tammy’s farm, but should a sheep, goat, alpaca, donkey, or dog wander past, she will know exactly who it is and what they are all about and let them know this with a quick pat or a gentle word. Having a caring, genuine relationship with those you work alongside every day is painstaking but essential work – whether it is running a farm or leading a school. I learned a lot about sheeping from my day at Tammy’s farm…and re-learned some lessons in teaching. The new school year began today, and my thoughts are very much with you. I imagine it is a busy day, I imagine that you are in the midst of putting aside summer thoughts for those of homework (ugh, that dreaded word!) and navigating your way through the old school with a new schedule, and I imagine that you are already looking forward to next summer with longing. * I wish you a year of owning your learning. Your learning lives are precious, don’t let anyone waste this time. Call out classmates and teachers who seek to divert this time with rambling diversions and classroom shenanigans. Ask (politely, of course) for the purpose behind assignments – how will they advance your powers of reading, writing, and thinking? Challenge (politely, of course) busy work, for you deserve better than that. Don’t allow your fellow classmates to waste time in ways you are already wise to, for you deserve better than that, as well. Find those books, stick with them, learn and grow from them. Keep writing – keep discovering what moves you, what interests you, and how you can change the world with the power of your words. keep these in mind when you read or hear something new, know the difference between what Dr. Beers called “a question that needs to be answered versus a question that needs to be explored”. A lot of class time will be spent on the former, but you will learn much more if you pursue the latter, even if it’s on your own time and out of school. Aim to understand your history, and the history of our nation. Soon enough, you will come of age to be able to vote and to change the course of our country; what you know, and allow yourself to know, will determine our future. *I wish you a year of kindness. School life is hard, and small acts of intentional kindness just makes the experience better for everyone. Don’t forget to be kind to yourselves, too – learn from your mistakes and failures, don’t beat yourself up over them. Words are hard to take back, so take that moment to think about their power before you text, post, speak. Jen Vincent at Teach Mentor Texts and Kellee Moye and Ricki Ginsburg at Unleashing Readers cohost It’s Monday! What are You Reading? For this Monday’s #IMWAYR post I have two books centered around characters who persisted in spite of facing almost insurmountable odds. 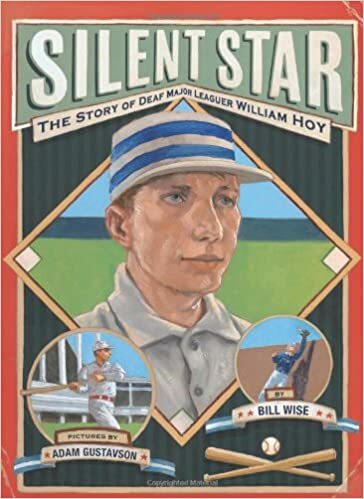 In Silent Star: The Story of Deaf major Leaguer William Hoy, Bill Wise tells the remarkable story of William Hoy, who would not let his hearing impairment (caused by a childhood bout of meningitis) stand in the way of his dream to play professional baseball. Once his talent for the game had opened the door to this seemingly unachievable dream, Hoy made the most of the opportunity by strategizing carefully and working twice as hard as his teammates. He set many records, some of which still hold today. This would be a wonderful book for classroom libraries – an inspiring story, well told and illustrated. 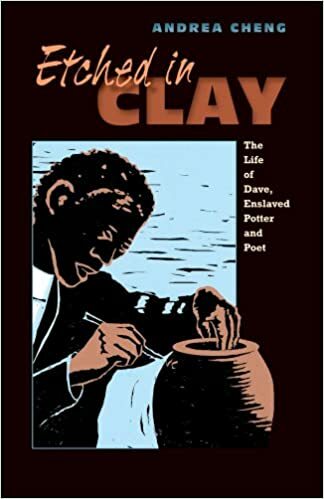 I’ve read news articles and pictures books about Dave Drake, a gifted potter who was born into slavery in antebellum South Carolina, and whose craftsmanship earned him a reputation far beyond his small town of Edgefield. Drake was all the more remarkable because he had learned to read as well as write, both of which were against South Carolina law. Determined to leave a written record of his thoughts, as well as sign his name to mark each of his creations, Dave etched both on the pottery he created – opening himself up to grave danger each time. Hearing from each character allowed for a richer reading experience, and I imagine for meaningful and interesting classroom discussions as well. I could see middle school students performing this as reader’s theater, as well, with pauses to write about and discuss the experiences of all the characters in this complicated and tragic period of American history. Cheng’s brilliant and evocative woodcut illustrations add another wonderful dimension to the story as a whole. Today’s Poetry Friday is hosted by Carol at Carol’s Corner . Mrs. Kaiser is my first-ever teaching mentor, and being a “mom-volunteer” in her classroom is the experience that set me forth on my own teaching life journey. The little fellow directly below her (the one with his shirt half hanging out and his khakis already showing signs of playground frolic) is our Ben. Unlike his sisters, who raced into every pre-school day with huge smiles of anticipation, Ben had started almost every pre-school day with tears and tantrums. Of course, each teacher reported that he had settled in the moment I left, and he was always full of happy news when I picked him up…but, by the time he was ready for kindergarten, I was dreading that inevitably difficult send off on the first day, I was conditioned for it. That morning, we had walked to school and watched from the sidewalk as Mrs. Kaiser stood by her classroom door to greet her A.M. class. That afternoon, we returned again and took our place in the line outside her door. The bell rang, Mrs. Kaiser stepped out, and I remember looking at Ben and seeing his face light up. He could not wait for school to begin. There were many school and college send offs in the years to come, but that one is my favorite. where Miss Wynn waits with the name tags. of denim and sharpened pencils. eyeing each other like sprinters at the blocks. above a paper grove of sugar maples. My last day as a sixth grade teacher is an experience I am still processing. In some ways, it followed the same rituals as every last day of school for the members of the Room 202 community: desks to each side of the classroom, the treats table set up, dancing, music, and the door open to alumni streaming in. Oh, and also hugs…many hugs. And there were the children, best of all. The love and sense of nostalgia in the room were often too much to bear. It is hard to let go of what you love…and we had a hard time of it. Look for the helpers…be the helpers. These were my final words for my kiddos. 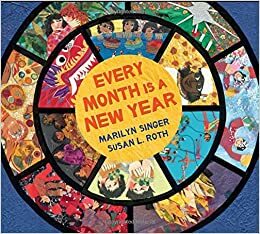 Singer’s lively and joyful verses are perfectly accompanied by Susan L. Roth’s exquisite mixed media collage illustrations, which are so vivid and full of texture. Every Month Is New Year is a pleasure to read and share with children of all ages. 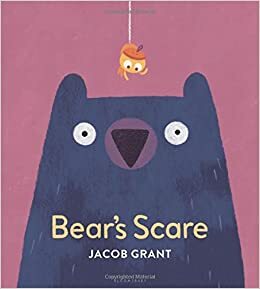 Jacob Grant’s charming book Bear’s Scare is just the book to read if you are (like me) averse to spiders. Bear shares his spotlessly clean and tidy house with Ursa, his small stuffed friend. All is well in Bear’s world, until he finds spider webs here and there. He turns his house over in order to find the culprit, to no avail. In all the tumult, Ursa loses an arm and Bear is distraught…until Spider finds a way to save the day. Michelle Kogan hosts the Poetry Friday Roundup today. Today, I will turn in my classroom key and my building pass, and leave the middle school which has been the heart and soul of my teaching life. What lies ahead is somewhat clear: caring for my aging parents, bringing a farm back to life, writing the books that I have been wanting to write. Today is the end of one path, and the beginning of another. Even as I grieve for the turning, hearing (always) the call of the children I have loved and taught and learned alongside these many years, I know that the other path is the way now. I have arrived at Frost’s diverging roads…I know where I must go.